Appledore Island, Maine, June 2007. I weave through the crowded nesting grounds, wearing a customized helmet with three plastic pipes glued to the top to ward off harassment from above. An eruption of shrill squawks announces my arrival at the heart of the gull colony. An agitated Great Black-backed Gull launches an attack. I duck, the bird’s efforts to land a swift kick to my skull thwarted only by my protective headgear. A short distance away is my refuge, a makeshift blind overlooking a rocky ravine. I sprint the last few yards and climb inside. I turn my telescope to a far ledge covered with gulls, focusing on one gull in particular. The one with yellow legs. This story begins in May 2007, when Appledore Island welcomed two new visitors to its craggy shores. I was the new summer research intern, having just completed my junior year at Yale, where I was a biology major and an ornithologist-in-training. Months earlier I’d applied to the National Science Foundation’s Research Experience for Undergraduates Program, which gives college students the opportunity to spend the summer engaged in scientific research. I was selected for a project on gull ecology supervised by Julie Ellis, a research professor at the Cummings School of Veterinary Medicine at Tufts University. So, while many of my friends flocked to city internships, I boarded a small boat in Portsmouth, New Hampshire, and headed east to the Isles of Shoals. Appledore Island is located seven miles off the coast, the largest of the rocky islands that form the Isles of Shoals. The archipelago straddles the Maine-New Hampshire border, and Appledore Island falls on the Maine side. The island is small — about half a mile at its widest — and is dominated by shrubs and rock. As a 17th-century explorer put it, “Upon these islands I neither could see one good timber-tree nor so much good ground as to make a garden.” Despite this, the isles have enjoyed a vibrant history, which includes the likes of Captain John Smith and the infamous pirate Blackbeard. In the late 19th century, Appledore Island was the site of a flourishing artists’ colony and boasted a grand hotel, which burned in 1914. Old pottery shards from the hotel dinnerware can still be found on the island; once, to my delight, I discovered a small piece of a porcelain plate half-buried under a clamshell, just a few yards from the water’s edge. Today the island is home to Shoals Marine Laboratory, which is operated by Cornell University and the University of New Hampshire. It is also home to hundreds of breeding Herring and Great Black-backed Gulls that arrive each spring to find mates, build nests, and tirelessly rear their offspring, many of which will not survive to fledging. It is difficult to say exactly how long gulls have been nesting on Appledore. Like many birds in the late 19th century, gulls were hunted by the thousands to support the feather trade. However, during the 20th century, gull populations rebounded. On Appledore, gull census data have been collected since the 1970s. Currently about 750 pairs of Herring Gulls and 375 pairs of Great Black-backed Gulls nest on the island. That said, the numbers were in the thousands just 15 years ago. In 2004, Ellis initiated a gull-banding program on Appledore, resulting in the identification of more than 4,000 adult and young gulls of the two species. 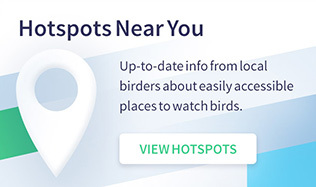 Each bird receives one band on each leg: a stainless-steel band containing a unique identifier issued by the U.S. Geological Survey, plus a green or black field-readable band with a three-part alphanumeric code. When a birder, scientist, or “larophile” (a person who loves birds of the gull genus Larus) spots a banded gull, he or she reports it, resulting in new information about the movement and behavior of New England gulls. I, on the other hand, knew little of the Appledore gulls when I ventured to the island for the first time. On the boat, I announced to one of my fellow interns that I would be studying gulls. She had spent the previous summer on-island. “Oh…” Her eyes grew wide, and she looked worried for me. “Good luck with that,” she said. When we arrived at the dock, I could see the reason for her concern: The gulls ruled the place. I nearly dropped my duffle bag when I stepped too close to the nest of a Great Black-backed Gull; it warned me off with a foreboding kek-kek call. The vocalization is a low-level response to a threat, the first in a series of aggressive behaviors aimed at predators and intrusive researchers. Soon I would become well acquainted with the other defenses in a gull’s arsenal, including a remarkable — if unfortunate — ability to unload waste products on its target with astounding accuracy. Ellis, with whom I had corresponded but not yet met, greeted me at the dock. She had important news. Another newcomer had arrived on the island, a bird that didn’t belong. His arrival was discussed sensitively, in hushed tones, and I was quickly initiated into the inner circle. The day before, while Ellis and her colleagues had been out in the gull colonies, they had discovered an unusual visitor on a rocky ledge on the southeast side of the island. At first she had wondered, “What’s a Great Black-backed Gull doing over on that ledge? That’s Herring Gull territory.” But upon closer inspection, her team realized that the interloper was smaller than a Great Black-backed Gull and had a paler gray back and bright yellow legs — completely unlike the pink legs of Great Black-backed and Herring Gulls. It was a Lesser Black-backed Gull. What’s more, the Lesser Black-backed Gull was not alone. It was cavorting with a Herring Gull. Lesser Black-backed Gulls do not breed in North America, at least not outside of Greenland. 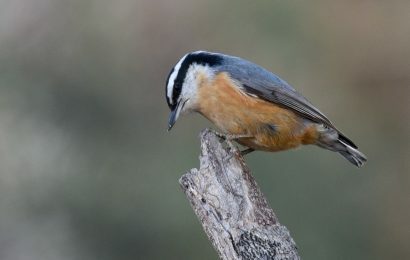 They typically nest in northern and western Europe, though their breeding range has expanded significantly in recent years, reaching Greenland in 1990. Their winter range has grown too; Lesser Black-backeds now frequently overwinter in the United States. 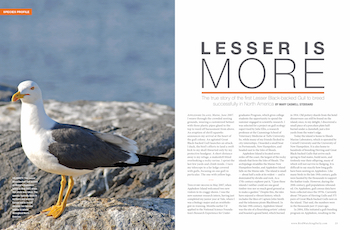 In an article titled “Rethinking the Lesser Black-backed Gull,” (Birding, January/February 2013), Amar Ayyash reported that no other gull species has undergone such a rapid trans-Atlantic expansion. 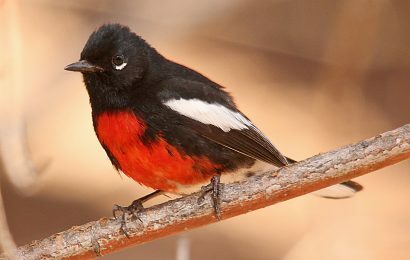 Lesser Black-backeds are now recorded in all the U.S. states and Canadian provinces. 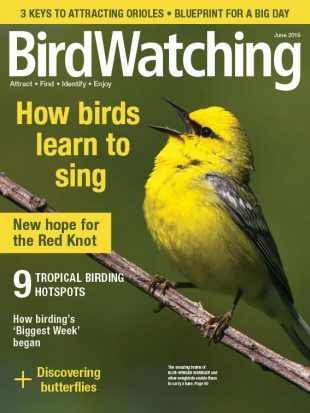 But — astonishingly — no definitive breeding record existed for Lesser Black-backeds in the U.S. or Canada, except for a short note in the 1993 issue of Bulletin of the Pacific Seabirds. In the report, a Lesser Black-backed Gull in Alaska was observed on two occasions at a nest with a Herring Gull, though apparently no chicks survived. Thus, if our Lesser Black-backed Gull on Appledore were to successfully breed with a Herring Gull, we would have the opportunity to document the first confirmed breeding and hybridization of a Lesser Black-backed Gull in the U.S. or Canada. On an island, I soon learned, small dramas quickly evolve into epics. That’s not to say that the discovery of the Lesser Black-backed Gull wasn’t thrilling — it certainly was — but the excitement that followed can only be truly appreciated by avid birders, longtime island-dwellers, or both. I remember huddling around a laptop with Ellis and her colleague Bill Clark, a retired, intrepid gull enthusiast and long-time volunteer for the gull-banding program, as we attempted to draft a press release. 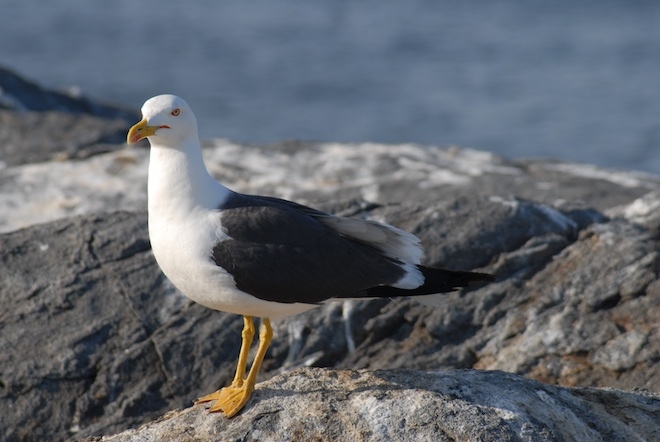 There were phone calls to bird experts on the mainland, including Steve Mirick in New Hampshire, who spotted a Lesser Black-backed Gull (perhaps the same one) on Appledore in September 2006, and Bill Etter in Pennsylvania, who had been tracking wintering Lesser Black-backed Gull numbers for years. There were frantic attempts to obtain a copy, by fax machine, of the Bulletin of the Pacific Seabirds. There were conversations with the Shoals Marine Lab leadership about whom to tell about the discovery. Would fervent larophiles swarm the island? Finally, a decision was made that the Lesser Black-backed Gull should be monitored daily, its activities recorded meticulously throughout the three-month breeding season. But who would volunteer for that? All eyes turned to me. It was exhilarating at first. The island engineers hastened to build a blind for me, a tent-like contraption on stilts, balanced on a rocky path about 65 yards from the gulls’ nest. Getting any closer might have spooked the birds. I looked east, out over the Atlantic. In the rare moments when my gaze deviated from my focal nest, I saw Black Guillemots and eiders and seals and — once — a breaching whale. But there was little time to enjoy the scenery. I was new to the study of gull behavior, and the learning curve was steep. Gulls have an impressive array of behaviors and vocalizations, each with a particular function or meaning. I pored over Tinbergen’s 1953 tome The Herring Gull’s World, the definitive guide to gull behavior. I felt like a prospective parent reading What to Expect When You’re Expecting. Sure enough, just as Tinbergen described, I watched the Lesser Black-backed Gull cough up nuptial gifts for his Herring Gull mate. We suspected the Lesser Black-backed Gull was a male, based on his behavior. I saw the pair do a strange dance near the nest — a choking display — to reaffirm their bond. I heard the Lesser Black-backed give a throaty long call, deeper than the Herring Gull’s, when his mate returned from a foraging trip. Apparently the couple was serious: They produced two eggs in the nest. Then I waited — along with the whole island it seemed — to see whether the eggs would hatch. In June, during the three or so weeks when the two birds incubated the eggs, tedium set in. The canvas roof covering my blind was coated, Jackson Pollock-style, with gull splats, and the biting flies had discovered that I was an easy and stationary target. My detailed observations bordered on voyeuristic. On June 14, 2007 at 3:56 p.m., I documented: “Following six minutes of exhibiting a gular flutter, the Lesser Black-backed Gull stood up off the nest, preened, looked down at the nest, shuffled feet, turned the eggs, and resettled on the nest facing northeast.” The observations continued in a blow-by-blow fashion, which I typed up and analyzed in a manifesto that grew to 162 pages before the end of the summer. Truth be told, the gulls spent a lot of time just sitting. I started adding notch marks to the wooden beams of my blind, one for each hour, just as a reminder that time actually was passing. But the initial excitement and the subsequent dullness eventually gave way to a satisfying equilibrium: At some point, I realized that I knew gull-speak. I understood the patterns and peculiarities of the Lesser Black-backed Gull and his mate — what times of day they preferred to incubate, which neighbors they particularly disliked, how they communicated with one another using mew calls and head tosses. I gathered that the Lesser Black-backed was feisty, seeing him once steal nesting material from a much larger Great Black-backed. The behaviors of the other gulls nearby were familiar to me, too. One massive Great Black-backed always attempted and twice managed to bite my left leg as I approached my blind. A nearby Herring Gull invariably returned from foraging with interest­ing food to upchuck for her chicks — most memorably, an intact hot dog, which flew out of her esophagus in a perfect, soaring arc. Hidden away in my blind, I was forgotten by the gulls. I became a privileged observer of their fascinating, complex world. The rest of the summer passed quickly. In late June, the eggs hatched. The news spread throughout the island, and I spent meals updating the Shoals masses on the daily activities of the two chicks. (I secretly named them Frosty and Mocha, against professional advice.) The successful hatching of the chicks was electrifying not just because it gave me a host of new behaviors to describe but also because it confirmed that the pair’s hybrid eggs had indeed been viable. Hybridization among gull species is common, but it had not been clear whether the Lesser Black-backed Gull x Herring Gull pairing would produce offspring that were both viable (can hatch and grow) and fertile (can reproduce). The arrival of the two chicks confirmed the former. We were also able to band the hybrid chicks, which — I learned while scrambling after one that darted down into the rocky gully — were surprisingly mobile for birds that could not yet fly. In July, I watched as the Lesser Black-backed and his mate endured the exhaustive task of parenthood. They fed, nurtured, and protected their offspring, all-consuming activities that now characterized the lives of adult gulls on the island — at least those whose chicks had hatched and survived thus far. The pair’s efforts were heroic. They attacked foreign gulls that approached the chicks and regurgitated an impressive supply of crab, fish, and landfill spoils. Once I remember watching the Lesser Black-backed brood the chicks, keeping them safe under his wings during a ferocious storm. Out on the exposed rock, the wind blasted him so viciously that he had to fight to stay in place. Life in a gull colony is dangerous for young birds, and only one of the pair’s chicks survived to the end of the month. The gulls we see at the beach, the ones waiting to steal our lunches, have beaten long odds to get there. On an overcast day in early August, I clocked my last hour in the blind and left the island, my 10-week tenure on Appledore complete. Not long after, the Lesser Black-backed’s surviving chick fledged, and its parents eventually departed from their territory. The 2007 breeding season was over. A year later, I moved to the United Kingdom and started a PhD program in zoology at the University of Cambridge. The Lesser Black-backed Gull kept busy, too. Each year from 2008 to 2011, he returned to the exact same spot on Appledore Island to breed. In 2008, a dedicated gull-banding team (known as the “gull wranglers”) was able to capture and band him and his mate. They also obtained blood samples for DNA analysis. Capturing wild gulls on a cliff is no small task. 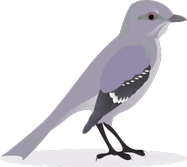 Fortunately, the birds have a strong drive to incubate their eggs, and they will readily enter traps placed over their nests. Before long, the Lesser Black-backed became known by his new band number, F05. 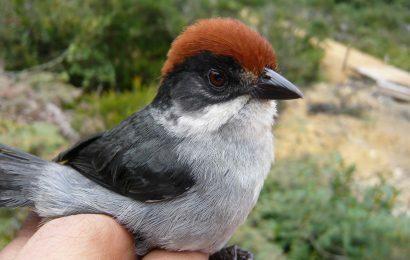 Genetic analyses confirmed that F05 was indeed a male. An analysis based on DNA microsatellites revealed that his chicks were true hybrids, possessing both Lesser Black-backed Gull and Herring Gull DNA. In 2010, in a scandalous twist, F05 returned to his spot to breed, but with a different Herring Gull mate. In 2011, F05 arrived with yet another new mate. Over the years, F05 fledged several hybrid chicks. On the science front, David Bonter, now the director of Citizen Science at the Cornell Lab of Ornithology, taught field ornithology each year on the island, introducing a new crop of students to F05 and the gulls of Appledore. Sarah Courchesne, a veterinarian at the Tufts Cummings School, helped lead teams of gull banders and reported on F05 and his activities. Steve Bogdanowicz, a research specialist at Cornell University, conducted detailed genetic analyses of tissue collected from F05 and his chicks. 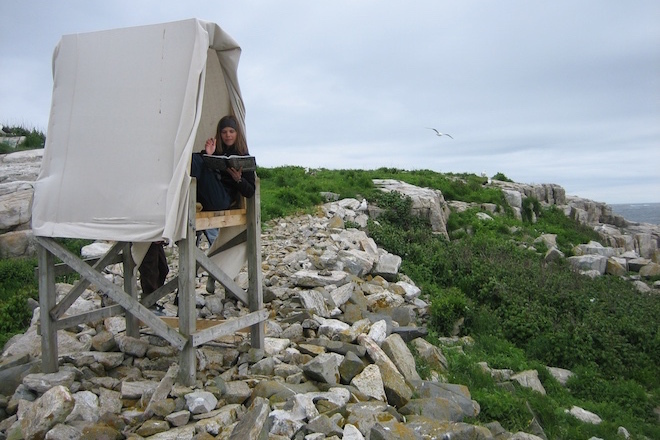 Julie Ellis remained the chief orchestrator of gull-banding research on the island, and Bill Clark still returns each summer for gull-induced punishment, all in the name of scientific knowledge. So it did not go unnoticed when F05 did not return to Appledore Island in 2012. We feared the worst. But then, in January of 2013, Michael Brothers spotted F05 in Daytona Beach yet again — the gull’s winter destination for five consecutive years. Where had F05 been in 2012? Had he taken the breeding season off, or had he discovered a more favorable breeding location? Would he return to Appledore Island in the spring of 2013? F05 had been given a new moniker since my day, a name apparently befitting a European gull. After we landed at the dock, a small group of us hurried out to the southeast part of the island, to F05’s ledge. He wasn’t there. But then I heard a deep, throaty “long call” I could recognize in my sleep. A Lesser Black-backed Gull flew in and landed on the ledge, right in the old spot. It was F05. For the next two weeks, I sneaked over to visit F05 often. My blind was long gone, but I found a comfortable rock that afforded a clear view of F05 and his mate, a rather haggard-looking Herring Gull. For a wild bird I had not seen in six years, F05 looked pretty much the same: healthy and strong, with the same electric yellow legs. I thought of his many adventures over the years. Ultimately, F05 had a difficult summer: The eggs he and his mate incubated did not hatch. I wondered if he would return to Appledore the following year or try his luck elsewhere. In May 2014, I returned to the island again. Bill Clark was one of the first people I saw when I got off the boat. His sweatshirt was covered with evidence of scatological warfare, and his foam helmet had several peck marks. “Tell me,” I said. Bill beamed. “He’s back!” Sure enough, F05 had returned once again, having spent the winter down in Florida. This year, F05 had a brand new Herring Gull mate. The next evening, I climbed up to the nest, careful not to twist an ankle while Herring Gulls dive-bombed my head. One egg was in the nest. But F05 and his mate were copulating — an Olympic feat requiring the male to balance on the female’s back — so perhaps there would be more. Several days later, I was halfway through delivering a guest lecture to David Bonter’s field-ornithology course when he was called out of the classroom. He returned with deeply troubling news: F05 was hurt. Badly. My stomach lurched. A small group of us went to investigate. With our binoculars, we could see a nasty gash on F05’s throat. We suspected a gunshot wound. Sometimes gulls are shot as part of landfill or airport management programs. Sometimes they are shot for sport, even though they are protected under the Migratory Bird Treaty Act. That evening, Bill and I watched F05 carefully, hopefully. Over the next few days, island staff and students — even the volunteer pastry chef — told me they were sending F05 good vibes. A T-shirt was designed in his honor. And F05 seemed to get better. He flew, he preened, he ate. Steve Mirick, who had been involved in the original sightings of F05 in 2007, even spotted F05 on the mainland, bathing in a pond near Rye, New Hampshire. It seemed that F05 would recover. The island rejoiced. Soon came another cause for celebration. That same week, a new banded gull, a third-year sub-adult, was spotted near F05’s ledge. It looked funny, with pinkish-yellow legs and a dark mantle. Sarah Courchesne and her students could hardly believe their eyes when they read the band. It was F07, one of F05’s hybrid chicks from 2011. None of F05’s chicks had ever been spotted on the island after fledging — until now. F07 was standing on a rock, not far from his father. A year later, in the spring of 2015, F05 did not return to Appledore Island. The last time he was seen was in Daytona Beach, Florida, in January 2015. Gulls typically start breeding at the age of four, so F05 would have been at least 12 years old in 2015, and possibly quite a bit older. Lesser Black-backed Gulls can live for 15-20 years. However, F05’s hybrid chick F07 did return to Appledore in 2015. He and his presumed mate did not build a nest, but he guarded a territory for several weeks, just a few yards from the spot where his father made quiet history eight years before. We know a lot about Lesser Black-backed Gull F05, thanks to the hard work of scientists, birders, and beachcombers. We know about his behavior and migration patterns. We know about his DNA, and about the DNA of his chicks. In future years, we will undoubtedly learn more about Lesser Black-backed Gulls. Why is their range expanding? Are other Lesser Black-backeds already breeding in North America, perhaps at a nearby but undiscovered colony? How will they be affected by our changing climate? The science is intriguing. Perhaps F07 will one day successfully breed. If he does, we may be able to demonstrate that he is a fertile hybrid — and watch as the genes of the legendary Lesser Black-backed Gull F05 spread throughout the Appledore population. Mary Caswell Stoddard is an assistant professor in the Department of Ecology and Evolutionary Biology at Princeton University. Her research investigates avian sensory ecology and physiology, with a focus on vision and coloration. In 2016, she received the Ned K. Johnson Young Investigator Award from the American Ornithologists’ Union. Ellis, J. C., M. C. Stoddard, and L. W. Clark. “Breeding by a Lesser Black-backed Gull (Larus fuscus) on the Atlantic coast of North America.” North American Birds 61 (2008): 546-548.